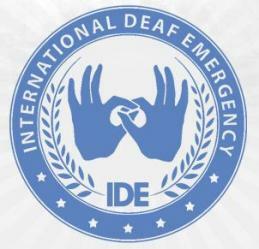 International Deaf Emergency (IDE), a 501(c)(3) non-profit organization, was started in 2010 by Deaf people who saw a need for communication access among individuals who were deaf and displaced during natural disasters or man-made crises such as earthquakes, wars, and famine. Current aid efforts consistently overlook the needs of deaf people. As a result, such individuals face greater hardship in recovering from such crises. As an independent, neutral organization, IDE works to provide humanitarian protection and assistance for Deaf people in the wake of disasters, and to ensure full communication access at all times. During the 2010 Haiti earthquake, IDE collaborated with the Water Mission, French Red Cross, the French embassy in Haiti and Friends of Deaf Haitians, which led to the first humanitarian camp created specifically for deaf Haitians.